Toyota will lead the way to the future of mobility, enriching lives around the world with the safest and most responsible ways of moving people. Through our commitment to quality, constant innovation and respect for the planet, we aim to exceed expectations and be rewarded with a smile. Trees are naturally strong — they’re useful, long-lasting, and continue to grow for hundreds of years. Our principles are like tree-roots, because everything we do is rooted in our beliefs. From there, vast and secure roots support the great tree-trunk — the strength and stability of Toyota. Branches lead to the twelve fruits of our vision, with the tree supporting everything — a metaphor for how we pull together to achieve success. 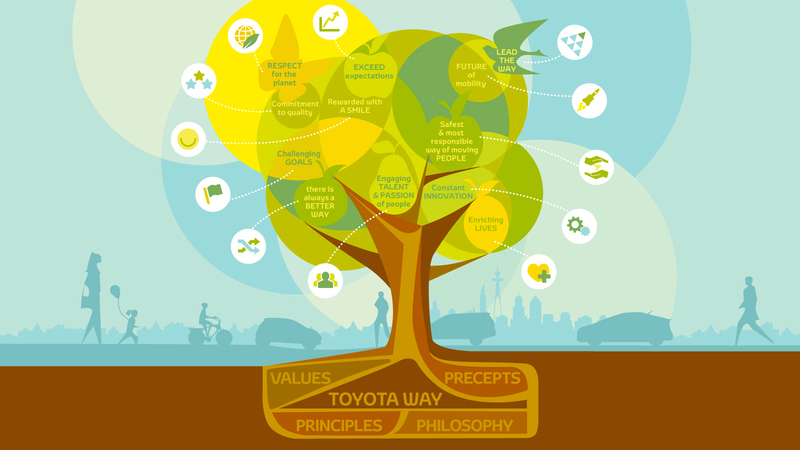 And the tree flourishes in its environment; a place full of people — Toyota customers around the world. Respect for the planet In everything we do, we will show consideration to the planet. We investigate and promote systems and solutions that are eco-friendly. Commitment to quality We constantly raise our standards for dependability, reliability and customer satisfaction. Challenging goals We aim high and work together... that’s who we are. There is always a better way The spirit of kaizen... reaching higher and challenging ourselves to find a better way in everything we do... every single day. Exceed expectations Our attitude is to anticipate and deliver to the needs of those we serve. Rewarded with a smile Customer satisfaction is best expressed with a smile. It promotes a behavior of gratitude and appreciation in all that we do. Engaging the talent & passion of people The power of our organization comes from the skill and diversity of our team members and business partners... solving problems and creating new ideas. Lead the way Toyota will be a frontrunner. We will seize opportunities and invest in the future. Future of mobility We'll develop new forms of transportation and pursue new ways to connect technology with people. Safest & most responsible ways of moving people Safety is our number one priority – for our employees and our customers. Nothing is more important. Constant innovation Our goal: “Always better cars.” We continually reinvent ourselves, introduce new technologies and stay ahead of our competition. Enriching lives around the world Through the concept of monozukuri, we will create jobs, develop people and contribute to society. Our guiding principles have long been a foundation for the way we manage our business. First drawn up when our business was started in 1937 and updated in 1997, they remain at the heart of our management philosophy. They help us achieve and maintain sustainable development through respect, trust and responsibility in our relationships with people, cultures, nations and the environment.